Gifts from the Pirates: "We are what we see. We are products of our surroundings." "We are what we see. We are products of our surroundings." When i started the blog i had hoped that somewhere down the line i would get to work with companies that would make a lasting impression on the boys growing up and brands i really respected. I had two in mind that had had a HUGE impact on my own childhood, had shaped the person i am today and helped with my development, not to mention getting me through some bleak home situations. I feel really lucky that I got to work with them both early on and continue to work with them on a regular basis. Despite these two companies having a huge impact on the boys lives too and that they give us countless hours of father son bonding time, an unexpected brand crept into the top spot and has opened up the way we play together (By giving us wheels). Micro-scooters completely changed the father son dynamic and being able to take the boys on scooting adventures really added another level to the crazyiness we get up to on a daily basis, not to mention the confidence scooting gives the boys, especially Opeie. I'll never forget the day my black Micro scooter was delivered, i had thoughts of packing backpacks full of things we would need for Goonies style adventures. It was clear from that day that those two wheels were going to change everything. There's something so addictive about scooting, especially as a parent because scooting with your children puts you right in the middle of the action. I love listening and watching the boys play and being able to be a part of it is so morish. The time spent whizzing around with them takes you right in to their world and Seth and Opeie love having me on their team. Its like being the head honcho of an MC only with vehicles powered by feet and the cutest bunch of misfits you can imagine. 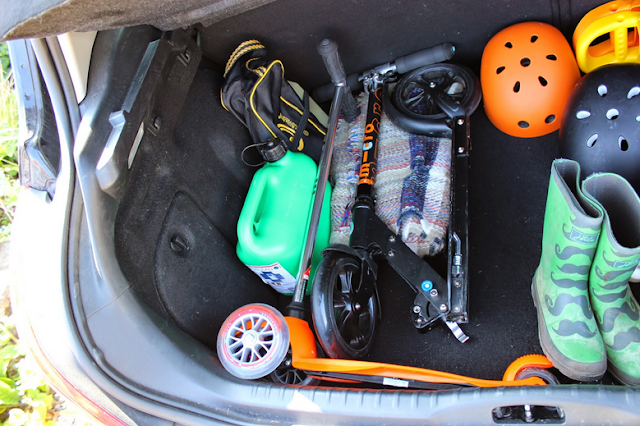 The scooters have been everywhere with us and can pretty much always be found in the boot ready for action. In fact we've been out scooting every day for the past three weeks, we are always on the look out for flat land and smooth trails to investigate. I ride into the school grounds to pick Seth up most days and its interesting that many of the moms want to have a go, who wouldn't, they are so much fun. Once you've had a try you don't want to get off. 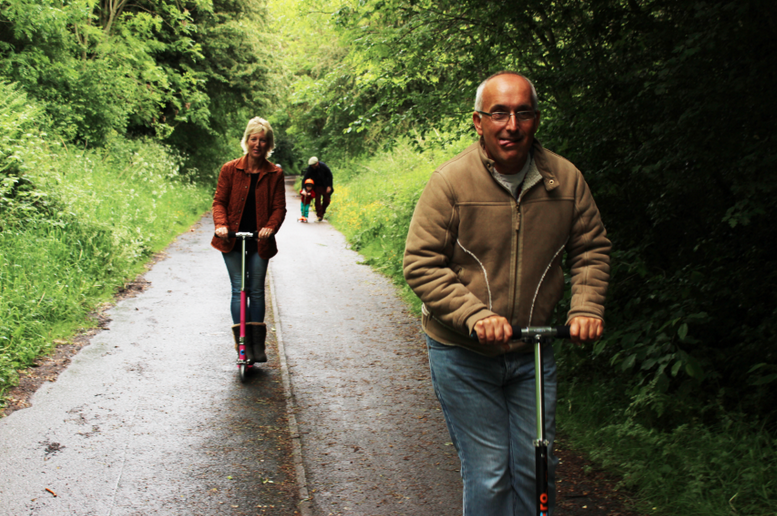 When we first got the scooters even nanny and grandad got into the spirit of things on one of our outings too. 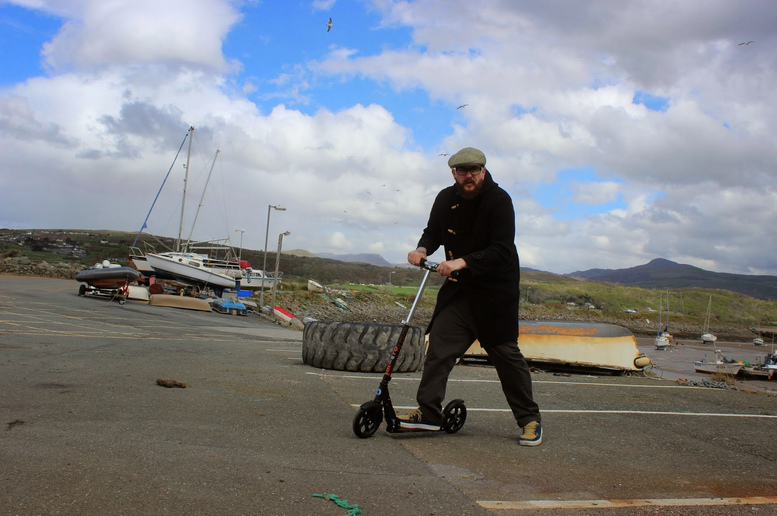 I own a lovely black micro scooter which has taken me everywhere, I had become part of a scooting gang and my life was complete. That was until the day a courier came to the house with a large intriguing package. The contents of the package were going to change the way i scooted and being the big kid i am i was very excited! The Micro Suspension scooter is what i can only describe as the Bentley of scooters.With a sleek new shape and a classy bronze paint job I couldn't wait to get it out of the box and take it for a test ride. Seth informed me that i should include a Hypothesis because he had been learning about it at school. At first glance i thought it was going to be a lot heavier and i was concerned about the suspension under the deck as it seemed low. But i expected the twin suspension to make journeys a lot smoother. I love the micro black but as with everything there were a few things i would have personally changed to make the ride smoother and more practicle. The double suspension on this new beauty instantly sorted my first issue. I don't live in a big city and there is a lot of uneven walkways, making some scooting quite bumpy and i think as the heaviest member of our scooting gang i probably notice the bumps a little more. I thought that having air filled tyres would be a great idea for solving that but the two part suspension makes an unbelievably huge difference to the smoothness of the ride, taking out a huge amount of the bumps. The second issue was one that wouldn't effect most scooterers (is that a word? what do you call someone that scoots?) but there is something the new suspension scooter offers that makes my adventures with the boys a little easier. A while back we borrowed a Gopro from a friend of ours and of course we attached it to the scooters. Seth has a Micro Flex classic scooter which has a 360 degree turn on the front wheel which i was always a little jealous of as the front mud guard on the micro black stopped that from happening. The suspension scooter adds the 360 turn (why do i need it i hear you ask?). Well, we fell in love with the Gopro and Mrs M brought us one to continue our adventures. Using a secure and solid bracket, Sometimes we film ahead of us and sometimes we film ourselves talking directly to the camera, the 360 degree turn means we can just spin the handlebars to change the shot, genius! I wanted to really put the scooter to the test to review it. Our micro scooters aren't something that come out occasionally and are hidden away most of the time. Ive had the suspension scooter about a month and i estimate that its done about 50 miles. That probably sounds crazy but a huge chunk of that was actually racked up a week ago when me and Opeie decided to go to London for a few days. The plan was to get to all the places we needed to be without using the tube. We scooted from Paddington (where we were staying) to the London eye (3.2miles) and back, also to Leicester square (2.4miles) and back and to the natural history museum (1.7miles) and back just to name a few. It was an awesome few days and being able to scoot long distance smoothly is great and so convenient. The thing that really blew me away though was that we saw London from a completely different angle and visited beautiful places that we would never have seen underground. 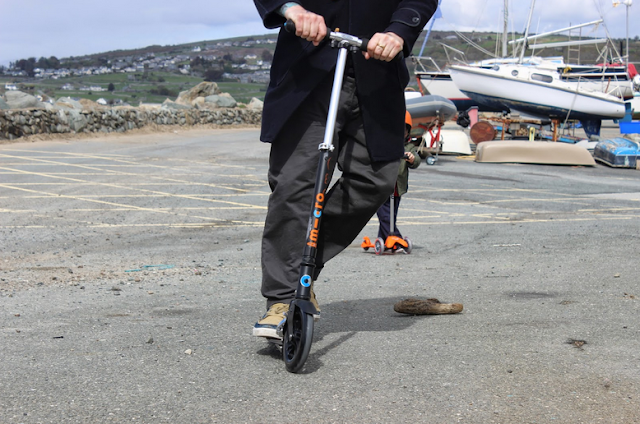 Some may say i am biased but i think if you're young at heart and want to get in on and be a part of all the fun and adventures your children are having then any of the adult scooters from the Micro-scooter range are a must. I didn't think for one second that they would have this much of an impact on the amazing time i have always had with the boys but scooting together really opened up our world to a huge list of possibilities and (especially with London) helped us see a beautiful more natural side to the big city.